Visit Tanzania and take part in hiking the Kilimanjaro via the Rongai route on this 7 Days Rongai Route Kilimanjaro Hiking Safari. Contact us to book this safari. After breakfast you will begin trekking to Kikilewa Camp (3,630 m), where you can see Kibo Volcano at its finest (barring cloudy weather). This will be a relief day, so after lunch you will have time to sleep before the next trekking towards Mawenzi Tarn Camp. In the evening after dinner the guide will check health conditions of the each person of the group and give the necessary instructions for tomorrow’s trekking. 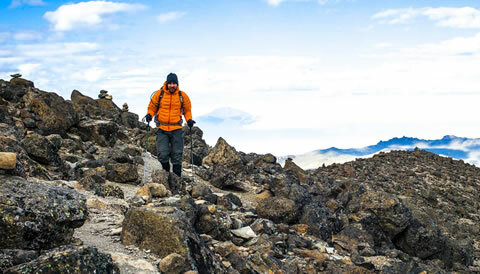 This day will be spent trekking towards Kibo Summit Camp (4,700 m). The landscape will change significantly to give way to a rocky semi desert. The actual trekking is not very difficult; just remember to stick with an appropriate pace to keep up your strength for the trekking to Kilimanjaro’s summit. When you reach the camp, we recommend you sleep well, avoid strenuous activity, and drink as much as you can, because that very night you will be ascending Uhuru Peak (5,895 m). End of the 7 Days Rongai Route Kilimanjaro Hiking Safari.